This year’s 64th Eurovision Song Contest will take place in Tel Aviv on May 14th, 16th and 18th, while the Slovenian representative will perform in the first half of Semi-Final 1 on Tuesday, May 14th. 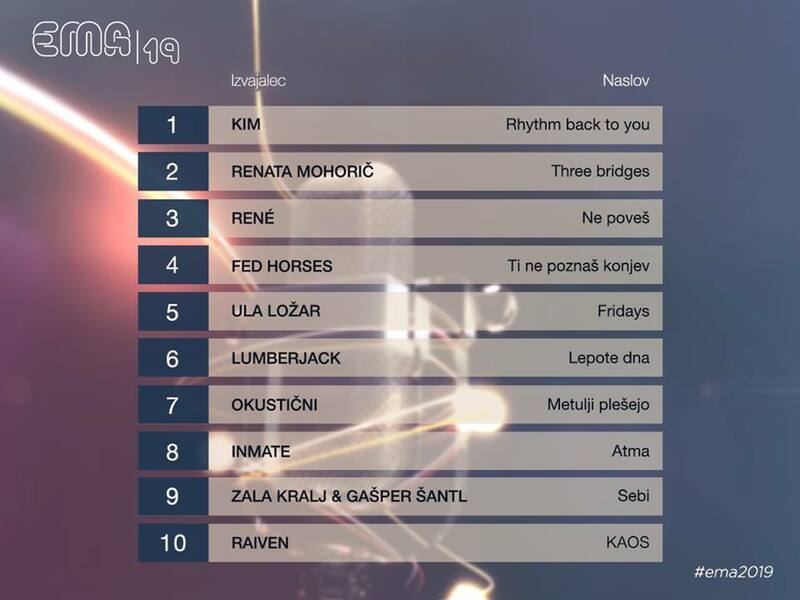 Kim, Renata Mohorič, René, Fed Horses, Ula Ložar, Lumberjack, Okustični, INMATE, Zala Kralj & Gašper Šantl and Raiven are the EMA 2019 contestants this year. The selection will take place on Saturday, 16 February 2019, at 8 PM CET in Studio 1 of RTV Slovenija. Direct stream will be available on TV SLO 1, Val 202, Radio Maribor, Radio Koper and RTV 4D. Selection of Slovenian potential representatives for this year’s Eurovision Song Contest will be hosted by Ajda Smrekar, while the radio host will be Maj Valerij. During the EMA, you will be also able to watch an alternative broadcast on rtvslo.si, which will be hosted by stand-up comedian and EMA 2017 host, Tanja Kocman, and stand up comedian Rok Bohinc. You will be able to watch the programme via RTV 4D and via rtvslo.si, as well as on the Facebook. In addition to the outstanding competitors, three music guests will also perform at the EMA 2019 stage: Lea Sirk, the EMA 2018 winner, InoT and Smaal Tokk. The day before the EMA 2019, you will be able to look into the backstage of the preparations, meet all ten competitors and other performers and host Ajda Smrekar. Since this year RTVSLO is selecting their twenty-fifth representative, RTVSLO will also remember some former Eurovision performances and some highlights of the EMA’s choices in the past years. ‘Ema pred Emo’ will be on air the day before, Friday, February 15th, at 8 PM on TV SLO 1, and will be hosted by Nejc Šmit.